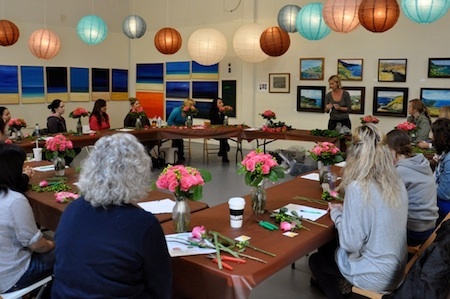 Join us for a flower arrang­ing class in our spa­cious flo­ral design stu­dio in the South­bay of Los Ange­les. If you want to learn how to cre­ate your own flo­ral arrange­ments, we can teach you. Flower Duet offers Flower Arrang­ing Lessons & Work­shops in a fun & casu­al atmos­phere at our spa­cious and fun flo­ral design stu­dio locat­ed in the South Bay of Los Ange­les in the city in Tor­rance or at your venue. Come on a guid­ed tour of the LA Flower Mart with Flower Duet — sign up today for a tour. 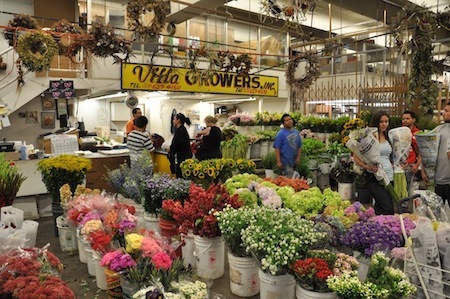 We offer pri­vate and group tours of the down­town Los Ange­les Flo­ral Dis­trict — affec­tion­ate­ly known as “the LA Flower Mart.” We meet at the mart at an easy-to-find loca­tion and offer a guid­ed tour which lasts for two hours with time for shop­ping at the end of the tour all for just $20 per per­son. A selec­tion of the class­es we’ve uploaded for our online cours­es! We also offer a col­lec­tion of online cours­es you can take from any device at any time! Sign up and try a few cours­es for free! 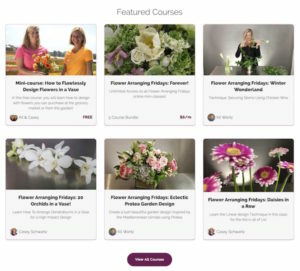 Since tak­ing a flower design class at Flower Duet, I have come to love work­ing with flow­ers!! My friends and I cre­at­ed all of the bou­quets for my wed­ding. Since then, my friends have asked me to do flow­ers at their wed­dings! Casey has been fan­tas­tic in answer­ing ques­tions for me, and assist­ing me with new and unique flower arrange­ments for these spe­cial events. Every time I look at my wed­ding pho­tos, I smile know­ing that I had the per­fect flow­ers for the per­fect day, thanks to Flower Duet.